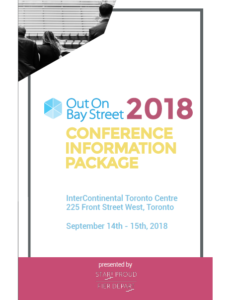 The Out On Bay Street Conference will be taking place on September 14th and 15th, 2018 in Toronto. The Conference is Canada’s largest LGBTQ+ Student Recruitment Conference where over 40 corporate sponsors congregate to meet Canada’s top talent over 2 days in downtown Toronto. The Conference gives students from all schools and programs the opportunity to meet professionals and recruiters from some of the largest employers in Canada looking for LGBTQ+ talent. Students develop their professional skills through our various workshops, learn about various career paths available to them, broaden their professional network, learn about LGBTQ+ support in the workplace, and are able to secure jobs and internship opportunities with companies who want you to be you. Throughout the two-day conference, students will from a selection of stream-based workshops, attend panel discussions, hear from distinguished keynote speakers, participate in or observe the Business Case and Moot Court Competitions, and meet other students and professionals from across Canada. Download our Conference Information Package for the itinerary, speakers, maps, and more! Resume submission to sponsors: after we help you edit your resume, we will submit it to company sponsors. If they like what they see, you will get an interview! Access to conference events, workshops, and galas. You will gain access to all of our conference programming – and we have a lot happening this year! Drink tickets. Need we say more?